Full name not firmly established in Street Fighter; from Spain. Height: 6'0", Weight: 208 lbs. See this page for Vega's depiction in the Street Fighter games, animation, and live action. Accessories: gold knife (92 Slice's), two gold knives (93 Banzai's), gold sword (92 Dojo's), gold sword (92 Storm Shadow's), gold axe (92 Dice's), gold sickle (92 Dojo's), gold figure stand (common). Of noble blood, Vega has successfully blended the Japanese art of Ninjitsu with the skills he learned as a matador. The result is a beautiful—yet fearsome—ballet which has earned him the nickname of the "Spanish Ninja." Vain and egotistical, Vega lives by the philosophy that beauty is strength. 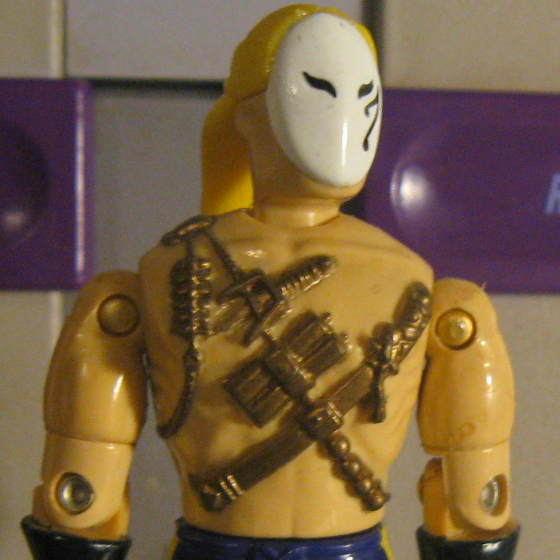 Despising anything ugly, Vega views himself as "perfect" and uses a mask to prevent his face from becoming scarred in battle. Used by M. Bison primarily as an assassin, Vega often dispatches his opponents by using his claw. Motto: "Handsome fighters never lose battles." Toy Notes: Featured in the Street Fighter commercial. Vega shares Banzai's attack move. Item #81094.